One of my favorite pictures from our New Zealand holiday. 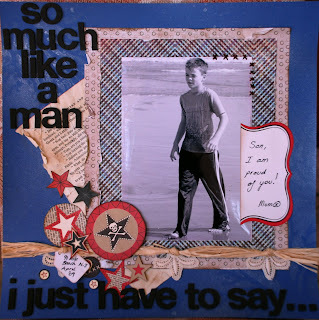 The title reads "so much like a man", "I just have to say" and the tag reads "Son, I am proud of you". I have used a mask and some glimmer mist on the background card stock, there is a vintage book page, some raffia across the bottom and I have incorporated some vintage doily across the bottom.